How Coal Industry Jobs Coexist With Rising Sea Levels In Virginia Virginia is dependent on coal mining and export, but it also faces routine flooding from rising sea levels. That irony is a very real, day-to-day problem for residents. 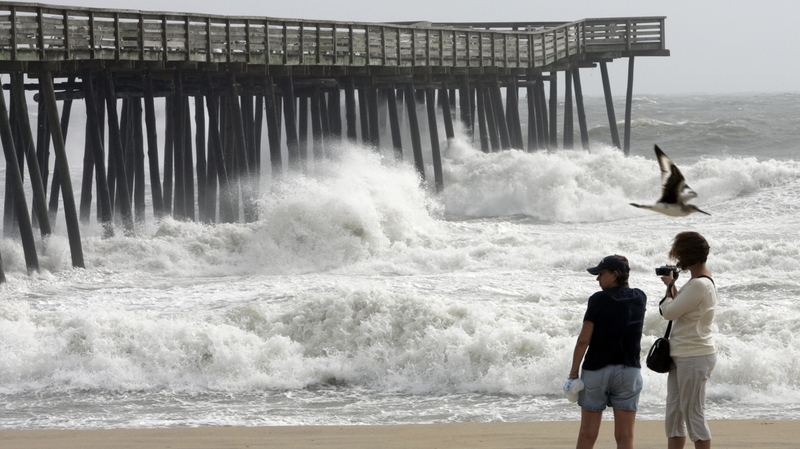 Rough surf pounds a fishing pier as Tropical Storm Hanna passes through Virginia Beach, Va., in 2008. Virginia is dependent on coal mining but it also faces routine flooding from rising sea levels. "We've got...[a] lot of old buildings around here: this apartment building, that church over there, been around since the turn of the last century," says Stiles, the executive director of Wetlands Watch, a Virginia-based environmental group. "You can sort of mark where the storms have come over the years, and you can see the progress of these storms as they come farther and farther up onto these buildings." Climate change may be an abstract concept to many people, but in the Hampton Roads area of Virginia, it's very real: Sea levels are rising, and the area is increasingly subject to flooding. At the same time, Virginia is a coal-producing state, and the nation's largest coal shipping port is in the region. 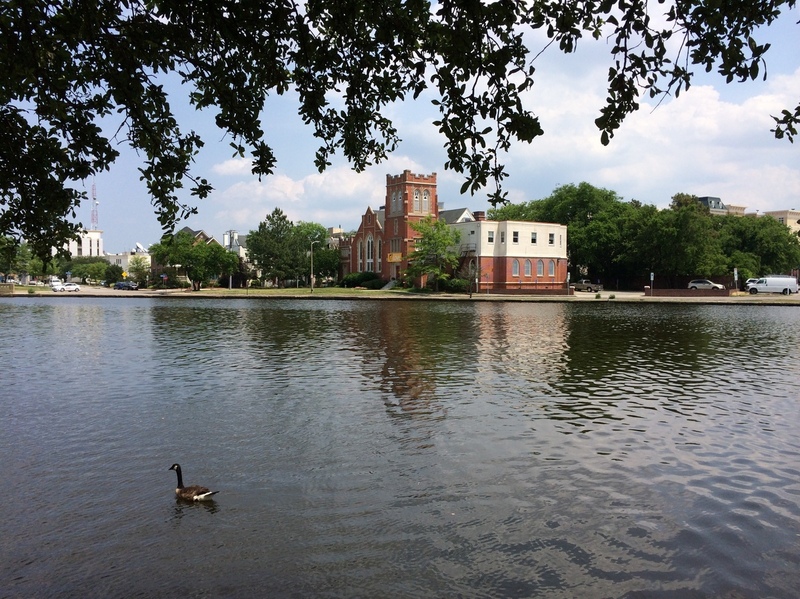 The Unitarian Church of Norfolk, as seen from across a small tidal creek known as the Hague. The church that Stiles mentioned is the Unitarian Church of Norfolk, likely one of the few houses of worship in America with a link to a tide chart on its website. The sea levels have been causing the church and its members some problems, says the Rev. Jennifer Slade, the church's minister. "People literally cannot get to church or may decide not to come because high tide is going to be at a certain time and they may not be able to get out," she says. No one has been stranded yet, but Slade says a memorial service over the weekend was carefully planned. "We actually had to time the memorial service and the reception to make sure that the service and the reception could happen ... before high tide." The Unitarian Church is considering moving to a new building; there are a number of reasons, but a big one is the flooding. Repeated high water forced the Chrysler Museum of Art to move its heating and cooling systems out of the basement to an upper level. Such problems are repeated throughout the region, says Larry Atkinson, co-director of the Climate Change and Sea Level Rise Initiative at Old Dominion University. "When there's a higher high tide and there's a heavy rainstorm, there's just no place for water to go, so there's been a lot of stormwater management, a lot of roads being raised," Atkinson says. "Downtown Norfolk, there's a big seawall with tide gates to protect the downtown financial district." Not all of Hampton Roads' flooding problems can be blamed on climate change: Atkinson says the region is also slowly sinking, making the low-lying areas that much more vulnerable to flooding. But there is also no doubt that sea levels in the area have been rising, as much as a foot over the past 80 years or so; a Virginia Institute of Marine Science report predicts another foot-and-a-half rise over the next 50 years. The government says the region, historically dependent on the sea for centuries, is the most vulnerable to sea level rise on the East Coast. Along with the world's largest naval port, Norfolk is also home to Pier 6, the hemisphere's biggest coal terminal, where long trains full of coal from throughout Appalachia empty their loads into waiting ships for export around the world. But that also makes Norfolk the nexus of the debate between coal and climate. "There is a bit of an irony that Norfolk has the largest coal export facility in North America and we've also got the highest rate of sea level rise on the East Coast," says Skip Stiles of Wetlands Watch. "Can't escape that irony." The irony isn't going away: Democratic Sen. Tim Kaine of Virginia says his state has to protect the jobs coal produces and deal with the harm caused by putting carbon in the air. "We're going to continue to use coal," Kaine says. "I mean, nobody is saying, 'Just throw a brake on the 35 or 40 percent of American energy production that's coal.' So in Virginia, we have coal to worry about. We also have sea level rise to worry about." In Tidewater, Va., that worry is a day-to-day thing. The city of Norfolk is considering a multimillion-dollar plan to erect new flood barriers, but it's unclear where that money will come from.